An industrial town in north eastern Kazakhstan, the country's principal coal-mining (in huge opencast pits!) and energy generation centre, which features the world's tallest chimney stack and most powerful transmission lines. But it's not only home to some industrial record-breaking sites, it was also a place of exile for political prisoners such as Alexandr Solzhenitsyn. More background info: the legend goes (in several similar variants) that the coal reserves around Ekibastuz were discovered by chance by a shepherd who made a campfire and noticed that the black pieces of rock he used to prop his pot on caught fire. He then marked the spot of the discovery of this strange combustible material by putting two blocks of salt on top of one another so he could come back later for more. This is also the origin of the Kazakh language name of the place, which literally translates as "two (eki) heads (bas) of salt (tuz)". Not only did some lone shepherd come back for more but a whole large-scale industry developed, which subsequently turned into the biggest coal-mining area of Kazakhstan and the Soviet Union. A settlement to support this industry was founded in 1898 and acquired the status of a town in the 1950s, when large-scale extraction began. Today, Ekibastuz (ca. 150,000 inhabitants) still provides about two-thirds of Kazakhstan's coal and generates about half its electricity from it in several huge thermal power stations. All this gives Ekibastuz a certain industrial-wastelands appeal, in particular those gigantic opencast pits. But there's another reason why the place could be of interest to the dark tourist: it was also used as a place of exile for political prisoners, a gulag. The most prominent inmate was Alexandr Solzhenitsyn, who had fallen from grace in Stalin's USSR through his writings. It was also Solzhenitsyn who came to fame (including a Nobel Prize in Literature) especially for exposing the extensive gulag system of the Soviet Union. He did so in particular in his main works "The Gulag Archipelago" and "One Day in the Life of Ivan Denisovich". It was for these that Solzhenitsyn was later imprisoned again by the KGB and eventually expelled from the USSR in 1974. Solzhenitsyn's links with the town of Ekibastuz and its gulag history are also picked up in the local museum. But be aware that Ekibastuz is far from being a touristy place. It is fairly easy to reach independently from Astana, but to get the most out of it – including a glimpse of those opencast coal pits – you need to have a guide and plan ahead! Something for specialist tastes really. But I found it fascinating. What there is to see: Ekibastuz is a rather drab provincial industrial town that has very little general touristic appeal. But the dark tourist can find a few fascinating things here, not all of which, however, are easily accessible. And then there are a few further points of interest, including a couple within Ekibastuz town itself; others are further out. Walk all the way from the regional museum to the eastern end of Gornyakov Street and you'll happen upon one of Ekibastuz's own remaining Lenin monuments. This one is standing a bit forlornly opposite a little park with a low-key war memorial and in front of what used to be the town's Miners' Cultural Palace (now a dinky shopping centre of sorts). Another Lenin statue is said to be outside the polytechnic college at the northern end of Mashur Zhussup street (but I didn't see that one myself). The main attractions of Ekibastuz of an industrial nature are a bit harder to get to see. If you have a local guide/driver you can ask to be taken to see two of the town's record-breaking claims to fame: one is the highest chimney in the world (almost 420 metres or 1377 feet!) at the GRES-2 power station, over 15 miles (25 km) out of town to the north. It's hard to believe that this chimney is almost as tall as the Empire State Building in New York. But it's still quite some sight. 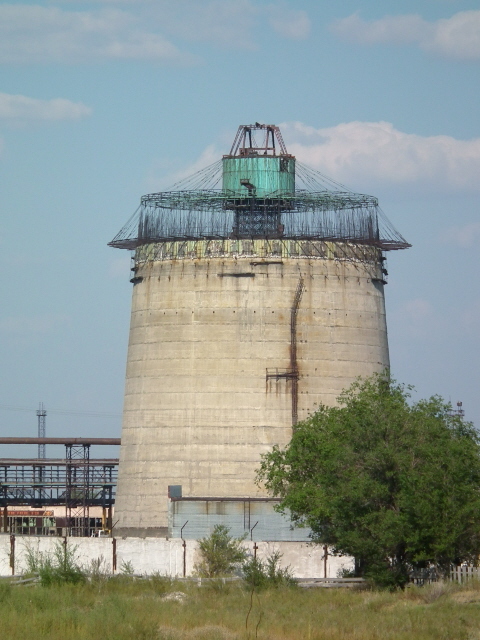 Note the stump of a second chimney at the southern end of the plant – evidence that the power station remains unfinished. En route you pass the GRES-1 power station, whose two chimneys are not that much shorter than their record-breaking neighbour's but churn out their unfiltered pollution with just a much pride. Smokestacks belching out such fumes are clearly still seen as evidence of industrial progress and achievement here. GRES-1, mind you, is actually the very largest power station in Kazakhstan! A true giant. 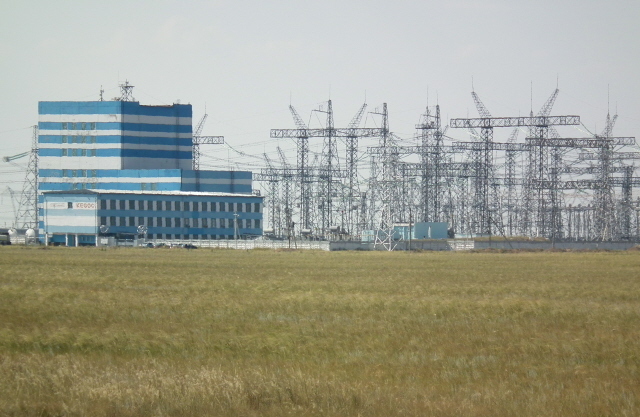 A few miles west of this, in the open steppe, is the transformer station (electrical substation) from where the world's highest voltage power line (at 1150 kV) distributes the electricity generated in Ekibastuz to the rest of the country and, more importantly still, onwards to Russia (the main customer of the GRES power stations). OK, it's not much of a sight as such, since you can't actually see electricity, but it's still something the locals are proud of. Back en route into town, note the symbolic coal-mining bucket-wheel monument just south of the turn-off from the main Astana-Pavlodar highway – opposite the massive spoil heaps north of town. Closer to town, at the roundabout at the northern end of the centre, there's a single bucket on a plinth serving as yet another monument to coal mining. The real thing, the gigantic opencast coal mining pits, however, are not normally accessible to casual visitors. There is a viewing platform over the major opencast coal pit called Bogatyr. But gaining access to it involves a lot of bureaucracy. But it is possible – and surely worth it. All this is, obviously enough, only for people with a special predilection for such things, those who get a kick out of industrial wastelands on an apocalyptic scale like this. For these, the view down into the Bogatyr pit will be an extra-special treat. Mainstream tourists may question your sanity, though. Location: Ekibastuz is roughly three-quarters of the way from Astana to Pavlodar, ca. 180 miles (290 km) east of the former, and 80 miles (130 km) west of the latter. The GRES power stations and transformer station are quite a bit out, north of the town proper in the open steppe. Access and costs: in part fairly easy, in part very restricted indeed. Details: in theory it is pretty straightforward to get to Ekibastuz from either Astana or Pavlodar, both are regularly linked by bus (trains between the two cities may also stop at Ekibastuz). But that's where the simplicity more or less ends. To get to see the GRES power stations etc. you will need a car, better still: a local driver/guide. I had the impression that our presence at the gates of the power station was only just about tolerated, and we were admonished to be careful when taking pictures. At the power line transformer station we didn't even get out of the car – but we stopped a bit further away in the field. This is clearly not mainstream … Getting into Bogatyr was right hassle – but we managed … ( see the separate entry). Going through a tour operator is also advisable with regard to booking accommodation in Ekibastuz. There are a few options, none of them great, but booking these yourself can prove problematic – they're simply not used to foreign visitors. With regard to food and drink, curb your expectations. This is a provincial town. The best you can hope for is that your hotel will provide basic meals and that you may be able to fetch a beer or something from somewhere. Eating out is limited to a few fast-food chain branches. At least it's cheap either way. No one will speak English here, so unless your Russian is very good it's yet another reason to use a tour operator that can provide guides. Time required: a day should normally do – but you may have to factor in bureaucratic complications in order to get to see the Bogatyr opencast coal mine (we were first turned away and had to come back the next day, when more red tape had been completed). Combinations with other dark destinations: nearest (though not really near – this is Kazakhstan we're talking about) is Aksu, which sports more industrial attractions, though on a somewhat lesser scale than Ekibastuz, as well as a park with communist statues. A bit further on, the regional capital of Pavlodar makes a convenient and rewarding stopover when travelling on into East Kazakhstan. The national capital Astana is also just a few hours drive away to the west. Combinations with non-dark destinations: none in the vicinity – you'd have to travel at least as far as Pavlodar or Astana.